Although the X-Bow is not the most powerful defensive building in Clash of Clans but it owns the fastest attack speed and the longest attack range. Its shots are made from classy :elixir: Elixir its terrifying power. Till now, there is only one hero who can uses the X-Bow – the Archer Queen! The X-Bow has two attack modes: Ground and Ground & Air. You need to load it by using Elixir to use and rearm it again whenever the shots run out. You can build X-Bow from Town Hall 9. Because the X-Bow has longest attack range in game and because of its power, you should place it in the core for lasting as long as it can. Always refill your X-Bow with Elixir. Without it, you will lost much more Elixir than the number you need to refill. If you have more than two X-Bows, have at least one in the Ground&Air Mode. There are plenty of good bases with perfect X-Bow placements that you can see at the Base Layout section. You can see a X-Bow is loaded or not by watching the small box on it. When it is loaded, there is a small Elixir box. When it is empty, there is nothing. Truly, the X-Bow has no weaknesses unless it is in the Ground mode (so you can attack the base with Air Troops). You can know a X-Bow is in which mode like in two images above (horizontal to the ground or title up). 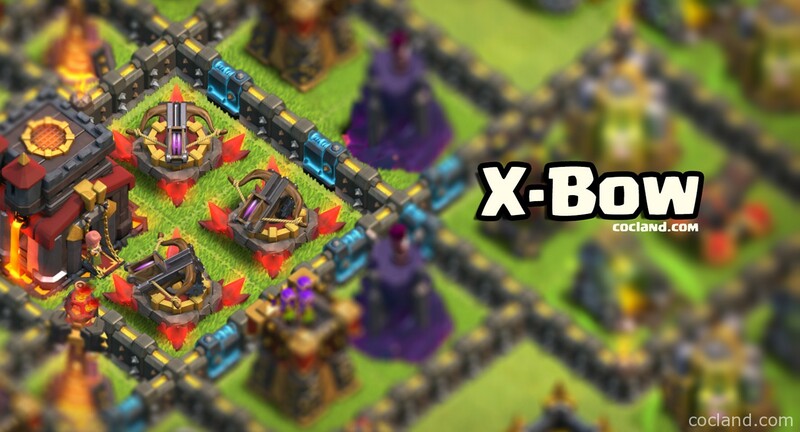 Because the X-Bow is one of the most powerful defensive buildings, It is recommend to use high HP tanker troops such as Giants and Golems to distract it and followed by bunches of attackers because it just can attack one target at a time. What do you thing about the X-Bow and do you have any tips or tricks about it want to share?